Secured Creditors one day liquidation of Anvil Arms in Lakeland. Dozens of complete automatic and semi-automatic weapons, ammo, supressors, gun cases, and more! 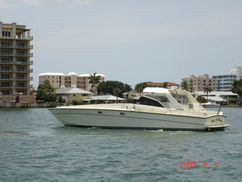 By court order, on Sunday April 11th at 2:00PM a Cary Marine 50 Express will be auctioned off absolute. By court order, on Sunday April 11th at 2:00PM a Cary Marine 50 Express will be auctioned off absolute! Call John Harris for more information! Click Here for Videos of the Boat!